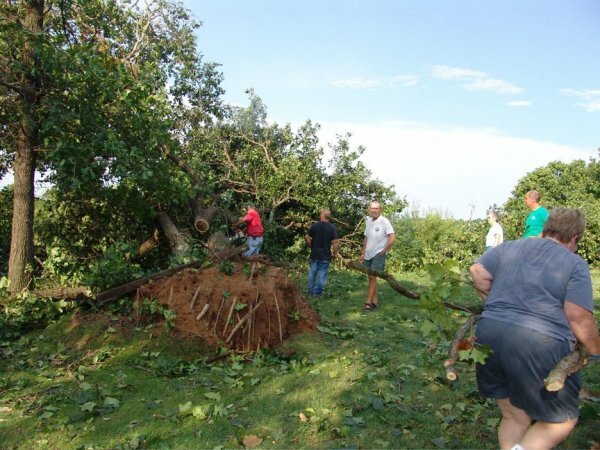 A storm came during the noon hour Thursday leaving debris in many yards including that of Ron Bowlyow, above and most of his neighbors in Oakwood Estates just south of Bluffdale. Bowlyow's sisters Bonnie Johnson and Peg Ingles and their husbands are helping saw and move trees and limbs. Bowlyow's suffered a loss of 9 of his 12 trees that shaded many Hosta's and shade loving plants he had under many of them. Below, Ray Denfenbaugh checks out the moisture of an ear of corn in one of his huge fields that was flattened Thursday's just west of his family grain facility, Beulah Land Grain in Kirkwood. His "Beulah Land Farms" corn crop was a total loss with the exception of 40 acres. "The plan is to clean up and rebuild," he said, "and to be finished in time for Harvest. We'll see." 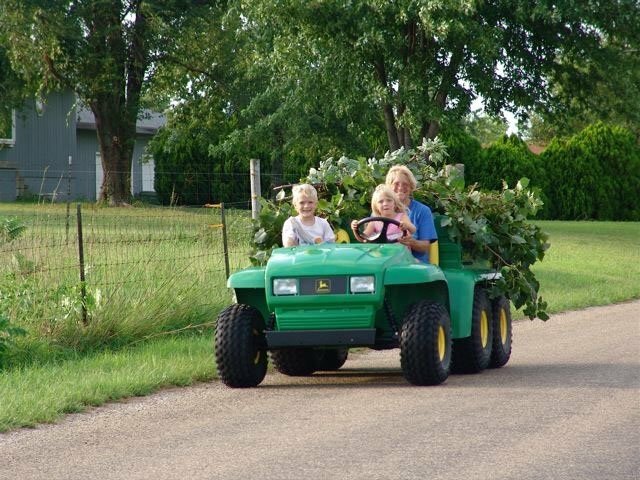 Justin and Nikki Bole and their Grandmother Lynn Huss move branches from her yard in Bluffdale.